The sweet, glazed carrot side dish often served in Japanese restaurants couldn't be easier to recreate at home with only a handful of pantry staples. 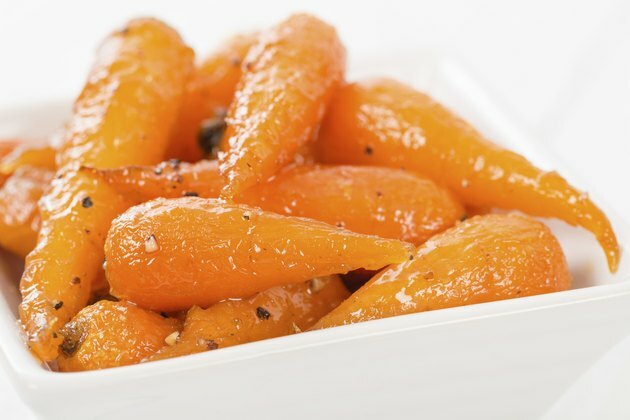 A small amount of your favorite sweetener, added as a subtle glaze rather than an overwhelming sauce, enhances the natural sugars in carrots, transforming them into something special in a matter of minutes. Customize the basic recipe with additional seasonings -- try fresh ginger, lemon zest or a little chili powder for a punchier flavor. Peel carrots and chop off their tops and tails with a sharp knife. Slice the carrots into thick pieces, bias slices, coins or batons. If you are using baby carrots, leave them whole. Bring a pan of salted water to a boil and add the carrots. Make sure there is enough water to fully cover all the carrots. Turn the heat down so that the water is simmering. Simmer the carrots until they are cooked but still a little firm. Take a bite to determine whether they are done enough. Smaller slices should take about five to eight minutes to cook; larger pieces or whole baby carrots will generally need 10 to 12 minutes. Drain the carrots in a colander and immediately slide them back into the pan. Put the pan back on the stovetop and turn the heat to medium-low. Add a small knob of butter and stir it into the carrots with a wooden spoon. Use just enough butter to glaze the surfaces of all of the carrots, so add a small amount at a time until the carrots are coated but not swimming in butter. Add a small amount of white sugar, brown sugar, honey, maple syrup or molasses, and stir it into the carrots. Carrots are naturally sweet, so start with just a teaspoon or two of sweetener. Add more later if you want a sweeter glaze. Add optional seasonings, such as lemon or orange zest, grated fresh ginger, or a pinch of chili or curry powder. Stir them into the carrots with the wooden spoon. Stir the carrots gently over the heat for about five minutes. The sweetener and butter should thoroughly blend to form a shiny glaze on the carrots. Taste one of the carrots. If you want them to be sweeter, add a little more sugar, honey, molasses or syrup and stir over the heat for a few more minutes. Serve immediately, while the carrots are still hot. While these carrots are a popular side dish at Japanese restaurants, they are equally appropriate to serve with a roast, grilled fish or chicken, or barbecued ribs. Combine carrots with other root vegetables and squashes, such as parsnips, turnips and acorn or butternut squash, before adding the glaze. Cut all the vegetables into pieces of a similar size.